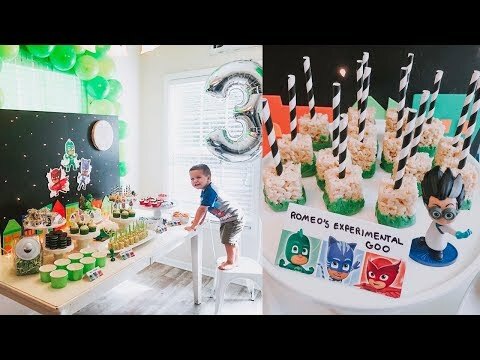 We celebrated Asher turning 3 with a PJ Masks party! He is obsessed with Gekko and it was so fun seeing his excitement over his special day! We had a treat for each character and a fun twinkly night sky backdrop! Today I’m sharing with you guys all the details, photos and a video of the fun! for ideas to work into any party theme, you are going to find some helpful tips in this post! From using a bath toy for your cake topper to inspiration for an easy interactive backdrop…I’m here to help! I really wanted to have a solid surface behind it to decorate. So we built one! I went to Lowe’s and grabbed two of the pre-painted chalk board boards. but I was on the speed plan with this project! table upright and have it stand a lone on the table. Once that was done it was time to drill some holes and add the twinkle lights! That part was really fun the kids were giggling and I enjoyed using a power tool. haha. I had this idea to make the night sky come to life for the kids and it was a HIT. painting tape on the backside. Super easy! When I finished, they all counted down and Sophia plugged them in! The moon was made out of a foam circle shape from Walmart. I covered it with floral foam spackle stuff that you get right next to the floral foam! Sorry can’t remember the official name. It made it a smooth and paintable surface. I used black and white craft paint I already had to make the moon really pop! The foam is super light weight so I just hot glued it onto the board. window boxes and roof details to each one. I chose the colors of the PJ Masks to tie it all together. house was theirs and where Gekko lives etc. etc.. and they did!! They totally did. Which made me so happy. I love creating party details that bring out the fun and spark their imaginations. I knew I wanted to add pops of green above the table so I just blew up some balloons. I just taped them to the wall in an arch shape. But before adding the balloons I covered the window with streamers. I just taped them up! It’s so easy! I did it all the night before and it held up great. They last for days! I had a number 3 Balloon that we blew up with a helium tank the morning of the party. I also blew up some of the green balloons to float around the ceiling. The helium tank ran out almost immediately so I’m glad I didn’t count on it for much else! The characters in the middle are just wall decals that I got on clearance at Walmart. really pop on the night sky! They are just taped on! I love how the dessert table turned out and Asher was obsessed with all the PJ Masks details! you focus in on a few key details it will all come together! and then extra green touches for Gekko! You could go as homemade or store-bought as you want with this theme. There’s plenty of candy and treats that are in these colors! I LOVE white dishes and always have my eye out for a good deal! used them on the table next to the customized treat labels. and some Blue M&M’s. For Owlette’s Owls I made owl cupcakes using Oreos and M&M’s. I made one batch of cupcakes and colored part of the icing red for these. I also had the kiddos sort out the red fruit loops for another O’ detail! white chocolate on it and sprinkled them with silver glitter sprinkles. the day and ran to Michael’s to grab the awesome edible spray paint! we just sprayed them and they popped! LOVE how they turned out. For Romeo we had store-bought Rice Krispies, cut in half, and dipped in melted green chocolate. for that black/white Romeo touch. It was his experimental goo and a kid favorite! We didn’t have a Night Ninja character but we still had a little something for him on the table! I saw these orange iced cookies at Walmart and they made me think of his sticky splat! smoothed them over a bit. Done and done! I had Mint Oreos and Green dum dums for pops of green on the table. I made cupcakes and topped them with DIY toppers. stuck them on white cardstock circles I cut out with my craft punch. Then Sophia helped by taping the circles to paper straws we cut in half. so we use them for topers and treat handles. and I used paper straws to add another pop of green as the handle! My kids love eating things on a stick! haha. in photoshop and printed them on cardstock paper. I filled snack size ziplock bags with some treats and stapled the favor tags to them. TOTALLY forgot to give them to most of the kids but the cousins got them! The cake was a fun detail to work up! I knew I could not make a cake this time.. I have a million kids. it’s just not happening. lol. used a knife to remove the rainbow sprinkles that were originally on it. I smoothed it over a bit and then had fun adding my own Gekko themed details! The Gekko topper is actually a bath toy! think it’s fun to have a cake topped with more sugar. Let’s get crazy! haha. candy to add a tall candy element to the cake. and mint M&M’s and regular M&M’s on the cake. I just kind of winged it and it all turned out cute! here in the Charlotte, NC area and it always feels more like home when you have company over! and adults and everyone was cracking up. you need to check them out. All the characters! The huge PJ Masks Photo Booth backdrop I found on Amazon! the funny face props and tattoos! break it up and use it to decorate more of your space. Photo Prop Sticks, Masks, Tattoos and Exclusive Birthday Pin! Thank you to our friends and family who came to party with us. You made Asher’s day! Happy Birthday sweet Asher. We love you and your super Gekko muscles. We all know someone who would appreciate a yummy home cooked meal delivered right to their doorstep! This gift idea is perfect for a family who just had a baby, adopted, is sick or as a random act of kindness! Grab my free printable!